The Fens in the East of England have often been compared with the Netherlands. The landscape of the Fens is low-lying and there are very few hills. Many of the engineers and labourers who drained the Fens and made them inhabitable brought their experience of how to do this from The Netherlands, just 200 km away across the North Sea. Many people of Dutch descent stayed in the area. Not only is the landscape incredibly similar to a lot of the Netherlands, but Fen people actually have a genetic connection with the Dutch. What's more, part of the area is actually officially called South Holland. The local council of this area has a tulip as part of their logo. You can also see parts 2 and 3 on youtube. But, there is also a big difference. While cycling rates in this area of the country are not as low as in some other parts, they are still incredibly low compared with the Netherlands. When we lived in the area, I would sometimes cycle the 90 mile distance between our home in Cambridge and my in-laws home in a rural Lincolnshire village. On these journeys I'd ride through this "Dutch" landscape past dykes and canals and windmills, with no hills to climb. However, I'd rarely see other cyclists. Such a lack of cyclists would be unthinkable on a similar journey in similar landscape here in the Netherlands. When I crossed the Fosdyke bridge (in the second photo) this road bridge was the only method for many km across this river, and cyclists had no alternative but to ride on this very busy road. It's part of Sustrans' NCN 1, and the British part of the North Sea Route. Cycling tourists are actually encouraged to come here, and the tourism board even creates Dutch language literature which compares the possibilities of cycling in Lincolnshire (as well as other parts of the UK) favourably with The Netherlands. The reason why "Holland" and Holland are not the same comes down to the rather more successful policies, campaigning and infrastructure design on this side of the North Sea. In The Netherlands it feels, and is, safe to cycle even when there is fog. Rotterdam in the province of South-Holland, is the second largest city in the Netherlands. It is best known for its important port, the busiest in Europe. The cycling rate, although very high compared to any other country, is low for the Netherlands. About 25% of all trips in Rotterdam is by bicycle. This is much lower than Amsterdam, where that figure hovers around 40% or Groningen where it is almost 60%. This may have to do with the fact that Rotterdam is very different from most other cities in the Netherlands. Rotterdam is younger than most larger Dutch cities. It started off as a fishing village when around 1270 a dam was built in the river Rotte. Only after the railways and a waterway to the North sea were finished in 1872 the port could really develop. It soon made Rotterdam a proud and important city. A city that was able to build Europe’s first skyscraper and tallest office building in 1898. 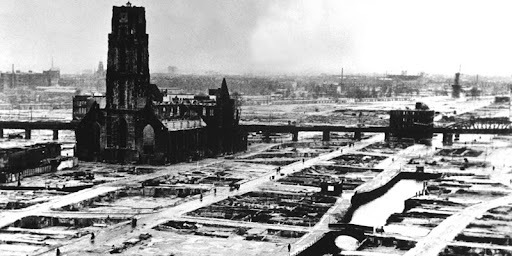 But Rotterdam lost its historic heart in World War II, when in May 1940 the Nazis bombed away the entire city centre to make the Dutch surrender. When the city was rebuilt from the late 1940s the city planned to do that 'according to the demands of modern fast traffic' and after the example of US cities. This resulted in wide multi-lane city boulevards right through the centre and big high rises, on a scale unknown in any other Dutch city. This is the reason that especially visitors from the US can relate to Rotterdam better than to any other city in the Netherlands. But the 1940s Rotterdam planners also came up with something entirely new: the main shopping area was created as the world's first pedestrianised street. When it was finished in 1953 it soon served as an example for numerous car-free shopping streets around the world. Luckily a long standing Dutch tradition was also not forgotten and the new wide streets were built including separate bicycle infrastructure. But just building infrastructure has proven not to be enough. 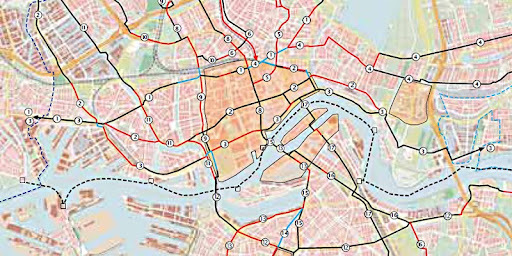 First and foremost the city wanted to strengthen the regional cycle network. It needed to better connect suburbs where people live to the centres where they need to go to do their shopping, go to school and work and stay for leisure etc. It also wanted to create two longer-distance high quality regional routes to Delft/the Hague and to Dordrecht. These should be completely finished by 2013. The quality of the cycle network was not up to modern standards. There was a lack of bike parking possibilities with homes. There is lower interest in cycling among the non-Dutch/new-Dutch residents. The city has exceptionally good public transport (metro/tram/bus/train). To make cycling more attractive by making cycle routes safer, faster and of a higher quality. To increase the parking possibilities at both beginning and end of cycle journeys. To target specific groups to get them to cycle more (youth, working people and immigrants). Concrete measures to make a cycle route faster involve giving cyclists right of way more often, making short cuts, shorten red times at junctions and making the surface of cycle paths smoother. Apparently a number of the goals of the policy were met. By looking around the city most of the cycle network seems to be up to standards now and the rate of cycling is rising. This results in more and more cyclists visibly riding on good quality infrastructure in the streets of Rotterdam. 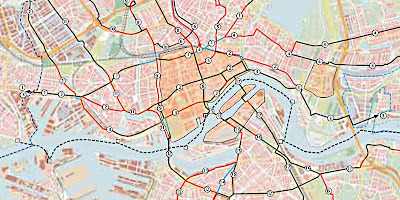 Most of the background data came from the ‘Actieplan Rotterdam fietst’ (Action plan Rotterdam cycles) by the council of Rotterdam on the site of Fietsberaad (in Dutch only). 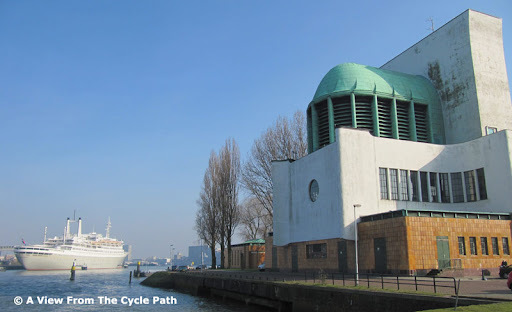 An article on the fast cycle route between Rotterdam and Delft is available in English. Different people have different ideas, of course, and some like to travel lighter than others. We've ideas for a touring toolkit in our webshop. For a limited period, make an order for more than €15, and you can also have one set of emergency bike lights for free. Add them to the shopping cart and then use the code "freelight" at the checkout. I'm sure many people in the Northern Hemisphere have noticed the number of extra cyclists who've appeared recently. It's the same here in the Netherlands. I went on a great social ride today, and we saw literally thousands of other cyclists on a ride through the countryside North East, returning through the centre of Groningen and between there and Assen. Thousands were out enjoying the sun on their bikes. Yes, even here cycling gets a boost at this time of year. I have to be clear that the these extra cyclists are of course no problem at all. It would be ridiculous to complain about there being more cyclists out when the weather is beautiful as it has been today, than a few weeks ago when the temperatures were hovering around zero and it was misty. However, there's a danger here for campaigners. Every year at about this time, people forget that they're looking at an annual trend and think there has been a genuine increase in the rate of cycling. It all looks so positive, so real. I've often wondered if the boost each spring is the reason why campaigners often seem convinced that cycling is "on the up" when year on year figures in many countries show it is reducing or stagnant. Human memory is fallible and easily fooled by a temporary boost which hides a long term trend. Spring, or September, are both good times of year to make impressive sounding cycle counts. The numbers which result are far better than if you take an average over the entire year. However, accurate counts and accurate statistics about cycling result not from this but from mundane counting procedures. At this time of year, it looks positive not just where you live, but everywhere. Enjoy it. Ride your bikes a lot. However, keep in the back of your mind that this doesn't necessarily mean that any progress has been made. Campaigning has to carry on, based on facts and not just on how pleasant it is to ride on a sunny day. More people will cycle everywhere if subjective and sustainable safety are provided. To achieve a high modal share and excellent degree of cyclists for cyclists of all ages, the Netherlands provides the best example to copy. However, even when looking to the Netherlands, campaigners need to vigilant as it is all too common for the whole point of things to be lost in translation when taken to another place. Enjoy spring and summer, ride your bikes a lot, but keep your eyes on the prize. On the "bike sharing world map" there is one strikingly blank country. You guessed it: the Netherlands. You could think that in a country of 16 million who possess 18 million bikes there would be no need for sharing bikes. But that would be wrong: the Dutch do share bikes and on a large scale. Since 2007 when Paris first started (after the example of Lyon), every self-respecting modern city seems to have bike share. Milan, Brussels, Bogota, London, Melbourne: some 200 cities worldwide. It is interesting that most of these schemes call itself 'free'. Yes, the first half hour is free, but keep the bike 2 hours and it will cost you 7 euros (Paris) or 6 pounds (London). Keep it even longer and Paris charges you a ridiculous 151 euros for 20 hours! Clearly these programs are designed for short use. For single trips, not round trips. If you have a meeting somewhere in town you can only hope the meeting place has a nearby bike-station too, for the rental fee would cost you dearly after a two hour meeting. 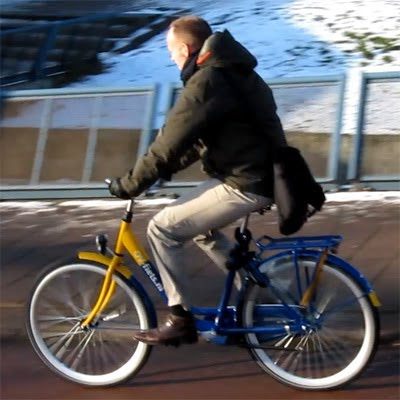 The Dutch have –like so many things to do with cycling- a different approach. Their nation wide program started in 2003*. What the Dutch started was not so much new, it was modernising what had existed in the country for decades. Almost every train station in the Netherlands has manned bike parking facilities and in most of those it has always been possible to hire a bike. But every station had its own way of doing things which took a lot of time and hassle. 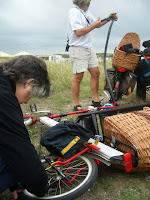 In 2008 the national OV-fiets program was taken over by the Dutch Railways*. Literally the name means 'Public Transport bicycle'. That is exactly what it is: an extension of public transport. Trains go almost everywhere in the Netherlands, but they do not get you entirely from A to B. To bridge that final part of your journey this bike scheme is perfect. You become a member for 10 euros per year. You get a subscription card with a pin-code or the subscription is directly connected to the card you already possess for train travel. That way you don’t end up with multiple cards in your wallet and it is once more underlining the fact that this is an extension of your train travel. With the card you can hire bicycles. In a manned station you simply present the card. The person manning the bikes scannes your card and the bike you take with you and you are on your way. Takes about 5 seconds. The hire fee is always for a 24 hour period and costs you just 3 euros which is less than a round trip by bus in any Dutch city. You can go where ever you want to go with the bike and you can even take it overnight. It has a lock so you can also park it. This scheme is designed for (longer) round-trips. It expects you to return to the train station to get back to where you initially started your journey. When you return, the bike gets scanned again and you can continue home by train. If you kept the bike longer, the next 24 hour period costs you 5 euros extra. There are also un-manned stations where the system works just like any other electronic bike scheme. You swipe your card and enter your pin-code. A bike is electronically released and you take it with you. The fee for the bike hire is automatically withdrawn from your bank account. A standard payment procedure in the Netherlands and this is arranged when you become a member. You can keep track of your journeys on-line. The scheme is a success. About 85,000 people are member now. 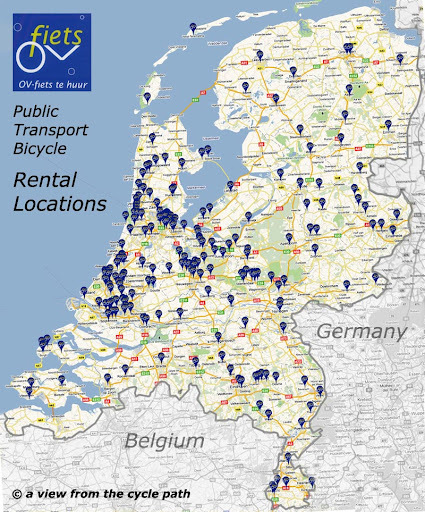 They made 835,000 trips in 2010 alone from one of the 230 bike hire stations that can be found all over the country. The bright yellow/blue bikes (the colours of the Dutch Railways) are very visible in the streets of the Netherlands. This bike hire scheme is really designed for residents, as it involves a membership that has to be arranged in advance. But for tourists other bikes can be rented from almost every train station too. I have had a subscription for OV-fiets for two years now. And it is wonderful, it really gets you to many more destinations. I have found myself cycling in places where I had never cycled before. What I like best is that with one subscription you can hire two bikes. So when you are on a journey with a friend you can both cycle to the end-destination together. Shared bikes can be very convenient on a personal level. But they can never be an important factor in mode share. For that you need people riding their own bicycles. * Update: Initially I stated the program started in 2008 but that turned out to be incorrect. The facts are as stated now. The oldest traffic tunnel in the Netherlands can be found in Rotterdam. It connects the two banks of the River ‘Nieuwe Maas’ (New Meuse). The first talks of creating a tunnel date back as far as 1899. Since Rotterdam has always been an important port (from 1962 to 2004 it was even the busiest port in the world) a bridge on this location would have had to be constructed too tall to allow sea ships passage. After long debates the decision to construct the tunnel was finally taken in 1933. The tunnel was built from 1937 to 1942. It consists of a set of pre-fabricated tubes that were sunken into a trench that was dug in the river floor. This technique had never been used in Europe before. Two adjacent tubes are for motorised traffic (2x2 lanes). Right next to those there are two stacked tubes. One for pedestrians, on top of which there is one for cyclists. Motorised traffic reaches the tubes via long access roads. 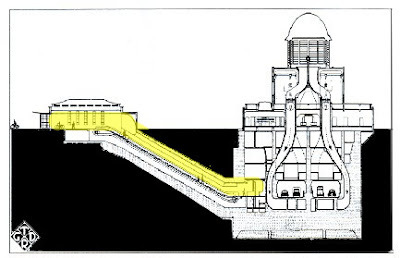 Pedestrians and cyclists enter their tunnel from an entirely different location by escalators. Therefore, as a cyclist you could be unaware there even is a tunnel for motorised traffic. Construction of the tunnel started in 1937. When World War II reached the Netherlands in May 1940, Rotterdam was heavily bombed. The entire historic city centre was wiped flat. However, the tunnel was spared and it was completed during the Nazi occupation. On the 14th of February 1942 there was a secret opening ceremony without Nazi participation. The tunnel is a magnificent and early example of elaborate separate infrastructure for cyclists and pedestrians versus motorised traffic. The visible ventilation towers with copper dome roofs are of high architectural quality. With the tunnel they have been a landmark for Rotterdam for almost 70 years now. About 75,000 vehicles and about 4,500 cyclists still use this tunnel daily. In the 1950s a staggering 40,000 cyclists used the four escalators on either side of the tunnel every day. In the morning three were used in the direction of the centre and in the evening it was the other way around. Nowadays there are far less cyclists. Partly due to the decline of cycling in the 1960s and 1970s but also because there are more bridges and tunnels now. The actual bicycle tunnel is 585 meters (640 yards) long and the deepest point of the tunnel is 20 meters (66Ft) below the surface. After the first bridge in 1878, the Maastunnel was only the second permanent connection across the river. Since the tunnel was built several other bridges and tunnels were constructed. Reducing the importance of this first tunnel. Besides more tunnels for motorised traffic outside the city centre, there are now also a railway tunnel and a metro tunnel. Cyclists wanting to cross the river in the city centre have a choice nowadays between the Maastunnel and two bridges. The 1981 replacement of the original 1878 bridge and the Erasmus bridge aka the Swan from 1996. But they can also use the elaborate regional "waterbus" network. On the waterbus bicycles can be taken for free. This video has explanatory captions which are only visible on a computer and not on a mobile device I cycled to Azor in Hoogeveen and back home this afternoon to get more front luggage racks for the shop. A 75 km round trip pulling a trailer, which makes for a decent mid-week workout. I went after lunch and returned just after the schools had shut, so there were a lot of school children making their way home both in the same and the opposite direction to me. A few of them are in the video and photos below. Most of the first half of the route between here and Hoogeveen is on roads, not cycle paths. However, these are not roads as you probably know them. Yes, in theory they are "shared" with cars, but in practice you only very rarely see a car using them. Some years ago, a parallel road with a higher speed limit was built to take the through traffic. The only cars which use the minor road are those which are accessing properties along it. Today I saw no cars using the minor road in either direction, but I did see a lot of cyclists. On the parallel road with the 80 km/h speed limit there were quite a few cars, but no cyclists. It is illegal to cycle on that road, but we lose nothing due to that. The Netherlands has 35000 km of cycle path, vs about 130000 km of roads. However, this doesn't imply that when you cycle on the roads that you have to "share" with large numbers of cars. Rather, you are segregated by mode, even when on the roads. What I'm highlighting here is road, not cycle path, so is not part of the 35000 km cycle path total. There are a lot of roads like this in the Netherlands, both in rural and urban settings. Sometimes it seems that cyclists from the UK in particular get particularly vexed over the issue of being "banned from roads". However, in this case it really makes no difference at all to cyclists. We get the better half of the deal, in fact, with a direct route which is only very rarely invaded by a motor vehicle. What cyclists need to fight for is better conditions for cycling, which result in more cycling. Spending time in defending a position of being allowed to use roads which the majority of the population find unpleasant may slow the decline of cycling, but it will never grow it. The best defence is a good offence. In the case of cycling, growth comes by fighting for cycling conditions with a level of subjective safety such that everyone will want to cycle, and direct routes which make cycling efficient. The Dutch have done this for a while now, with great success relative to other countries. A lone cyclist on the service road, while the parallel road for cars has several cars. Note that the street light is on the quiet road. Several more cyclists on the quiet road. The main road is now on the left of some housing, so it's temporarily out of sight. An adult cyclist blithely passes by a sign saying that he's banned from using the main road. Somehow he seems not to be concerned about this. Another adult cyclist, passing another sign, who doesn't seem to mind one bit about being banned from the road on the left. Two girls riding together with no concerns about motorists. 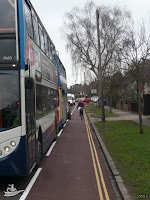 One of the points where the service road becomes a cycle path. This makes it discontinuous for drivers, and is another reason why the road we're using only has cars on it which are being driven to access properties along it. Now on the cycle path. This boy doesn't seem to feel sufficiently threatened by the traffic that he thinks he needs to hold his handlebars properly. An elderly couple out for an afternoon ride. They're heading towards a roundabout, which if you're on the cycle path you completely avoid. I'm also quite glad I'm not on the road. It wouldn't improve my feeling of safety either. Subjective safety is the big question. If there's not enough of it, people don't cycle. It's not just "for beginners". Experienced cyclists also also benefit from conditions which make cycling more pleasant. On the way home now. We're on the cycle path on this side of the trees, the cars are on the right. Here two bikes are being used by four teenagers. Coming in the opposite direction are another elderly couple out for a ride. Two more girls heading home on the cycle path. 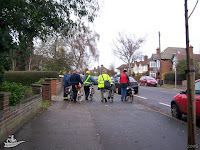 Back on the road, with more children heading home from school and using the full width. The cars are on the other road to the right of those trees. Another group of children riding home together. They were more spread out before they saw me coming in the opposite direction and made room. None of the photos or video show cars using the minor road. This isn't just due to me being selective - I saw no cars using that road today. The route highlighted by this post is shown on the map below. If the only route here by bike was the main road then there is simply no way that there would be this level of cycling, especially by school children. Few parents would see that option as safe. That is why even "on the road" it is important to have segregation of modes. Conditions like this are what makes the difference between 1% of journeys being by bike in the UK, USA, Australia etc. and 26% of journeys being by bike in the Netherlands. It's the reason why 16 million Dutch people make more cycle journeys between them than 300 million Americans, 65 million British and 20 million Australians all added together. It's also the reason why Dutch cyclists are the safest in the world. Hoogeveen and back is quite a regular journey for me now, and I've videoed it twice before. Article originally referred to 29000 km of cycle-path. This was incorrect - the Netherlands now recognises 35000 km.